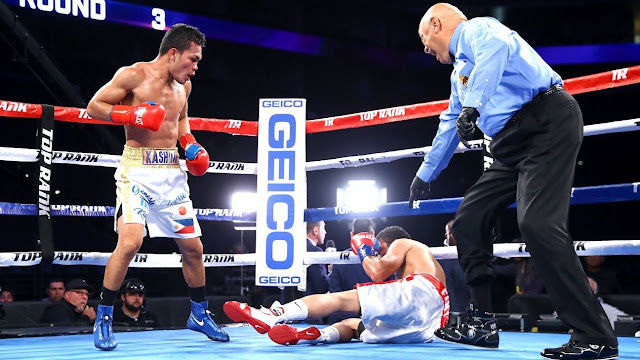 Watch the fight of the former World Boxing Organisation World Featherweight Title Challenger Genesis Servania vs. the Mexican Carlos Carlson on September 28, 2018 at the Oracle Arena, Oakland in USA. This fight is included in the undercard of Jose Uzcategui vs. Ezequiel Osvaldo Maderna interim International Boxing Federation World Super Middleweight Championship. Genesis Servania coming to this fight with a record of 31W-1L-14KO's and coming off a 2 KO wins, while Carlos Carlson has a record of 23W-4L-14KO's and won his last fight against Jesus Antonio Lopez Armenta via 2nd Round KO. Genesis Servania won via 3rd round TKO, the Mexican was counted to 10 after the knockdown.